Today I want to write about a really cool antelope that has amazing horns, the giant eland. These massive animals grow up to almost 3 metres long and weigh up to 1,000 kg, making them the largest species of antelope in the world. Males are almost twice the size of females. The large hanging dewlap is also bigger in males than females. Giant eland live in small herds of 15-25 animals and despite their size, they are amazing athletes. They can run up to 70 kph and jump 1.5 metres high. Both the males and females grow horns but the males’ horns are much bigger, growing up to 1.2 metres long. They use their horns to fight with each other. They also use their horns to break high up branches so that they can eat their leaves. They don’t have many predators in the wild, with only lions and spotted hyenas large enough to take them down. Giant eland are fairly common and live in grasslands and woodlands in the African nations of South Sudan, Cameroon, the Central African Republic and Chad. They are also be kept on farms throughout Africa and Russia as they have very rich milk, tender meat and can live in very dry, harsh conditions. 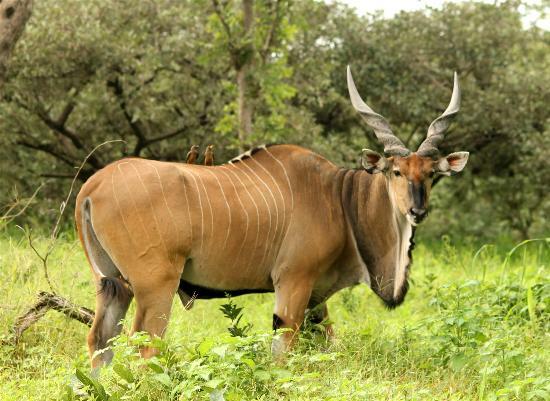 Are there any other interesting facts that you would like to share about giant eland?